ParticleSystem3D receive the stage for parameter, which is used to add a listener to the ENTER_FRAME Event. The SpawnRate is the rate of spawn particles, this means that if this value is higher you obtain more particles spawned per second. 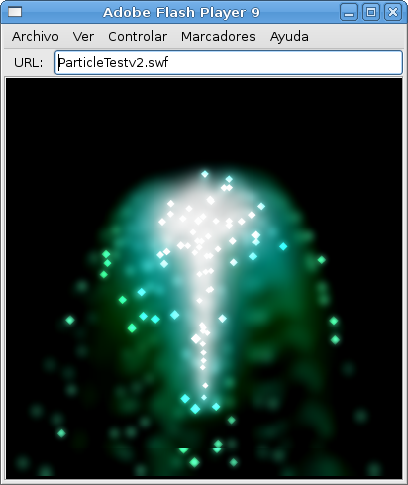 The particleClass property is the class or data type used by the particle system there are two types of particles for this tutorial, I used SimpleParticle3D only, the other type of particle BillBoardParticle3D is a billboard but I can’t make it work with the Effect branch yet. With the particleClass property set, the ParticleSystem3D knows which particle should create when we start it. Finally we should start the particle system so we call its method start. // Add a blur effect to the layer. // Set a little scroll in y for the effect layer. I will not explain what is done here because is beyond the scope of this tutorial, if you want to understand what happens here see the Andy Zupko Tutorial here. This is the method added as listener of the initialize event for a particle. In this function we set the initial values for the render layer, the size, life time, position and velocity of the particle. And this is the Update function for every particle update, in this function we change the particle velocity to obtain some kind of fountain effect and thats it.You can find the source code of the example here. And you can download Zeus Particles 3D version release here. Update: You can find a release of the particle system for PV3D 1.7 here . This entry was posted on February 22, 2008 at 3:26 pm and is filed under Actionscript, flash, Papervision3D. You can subscribe via RSS 2.0 feed to this post's comments.